THE method described in this paper was developed in 1955 during an assignment to carry out an inventory of the northern teak-bearing provinces of Thailand. The most important features here are that teak occurs scattered among other species of the mixed deciduous forest which has rather a low stock per unit area, and communications to the mountainous forests are generally very poor. It is evident that conditions will differ in other tropical countries where different methods may have to be evolved, and this paper only gives an example of an effort to deal with the present conditions of the forests in Thailand. The census started in 1956 and the results for five of the provinces representing the heart of the Thai teak-bearing area (see Figure 1) and yielding about 60 percent of the Thai teak were completed in June 1957 and are being issued this year. The photographs were taken in January 1953 on an average scale of 1:48,000 for the area below 1,000 meters above sea level. Teak does not generally occur above 1,000 meters so that contour line of 1,000 meters was marked on all of the photographs of the Northern Provinces, thus dividing the area into two main parts - below and above 1,000 meters above sea level. The sampling technique aimed at determining the proportions of the area of the strata recognizable on the photographs. FIGURE 1. Teak-bearing provinces of Thailand. a) Mixed deciduous forest. This is the teak-bearing type of forest. There is however, a rather high percentage of the area under this type which does not contain any teak white in the real teak-bearing part, teak seldom occurs in pure stands but is scattered amongst other species. Unfortunately the bulk of the photographs were not taken during the flowering season of teak (August/September). On some photographs (see Figure 2) taken at this time it is possible to distinguish between the substrata " teak-bearing "and " non-teak-bearing " mixed deciduous. b) Semi-evergreen. 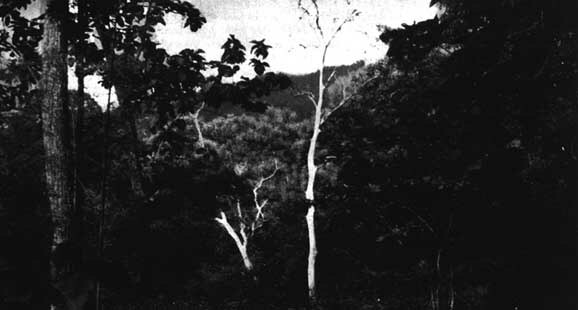 The big trees of the species Hopea and Dipterocarpus alatus can clearly be recognized as white spots even on the small-scale photographs. c) Dry dipterocarp type. A rather poor and low forest, but important for production of fuelwood. Severely overworked areas of this type can clearly be distinguished from old clearing or secondgrowths. Both of the latter strata do not contain any big trees, but they differ from each other in the tint of the ground on the photograph. The old clearings were originally mostly of mixed deciduous forest type. At this elevation the forest is inaccessible and mostly of hill evergreen type or savanna forests, mixed with some conifers on the mountains and semievergreen forests along the valleys. These forests being of importance for the water supply of the country, the degree of destruction inflicted by the numerous hill tribes (shifting cultivation and annual burning) needed to be estimated; this could be indicated by the special stratum " old clearing above 1,000 meters ". To obtain the area of the above-mentioned strata, their percentage is sampled photograph by photo graph by a suitable design to arrive at a sound average percentage for each province. The percentage can be changed into superficial measures, by assuming the official figures for area of the provinces as 100 percent. FIGURE 2. Two girdled and dead teak trees. In the background is a flowering teak. The sampling design itself follows the idea of the tract-line-system; because the dot-grid-system as well as the delineation system inside special sample plots on the photographs was not found satisfactory owing to the small scale of the photographs. The tract-line system consists of a square, 5.0 x 5.0 centimeters, which means approximately 2.5 kilometers for a scale of 1: 48,000, and which is transferred by photographing on a plate of glass. Each millimeter as well as centimeter is marked by dashes. This design is also printed on a form to be used as a record for each photograph (see Figure 3). The interpreter puts the glass design on the photograph to be sampled so that the point " 75 " of block 11 as indicated in Figure 3 lies exactly on the principal point (center) of the reference photograph. To facilitate this, the glass is prepared in the same size as the photograph itself (23 x 23 centimeters) and a line cross is laid out on the principal point, in a north/south and east/west direction up to the margin of the glass. Thus, the interpreter needs only to put the cross on the fiducial marks on the margin of each photograph. The principal point of the photograph is not identical with the center of the sampling tract. This is necessary in order to avoid any double sampling because of the 60 percent overlap if every photograph is sampled. The interpreter uses the mirror stereoscope and the four-fold magnifier and follows the line of the square. On the design of the form given in Figure 3, he marks boundaries between the strata mentioned above. Finally, he adds the, millimeter belonging to each stratum and puts the totals on the corresponding columns as shown in Figure 3 below the "square". The sum of millimeters (or percents) must be 100 for each block (two sides of the square). The sub-dividing of the tract into two blocks is necessary for the analysis of variance. It should be mentioned, that biased errors occurring from any wrong interpretation can be avoided only by very careful checking and proper training of the interpreters in the field. The daily work of one interpreter is about five photographs. FIGURE 3. A form for a tract-line system. After having finished five provinces, statistical investigations are made to decide whether it is necessary to sample every photograph. The sampling of every second or third photograph, may be sufficient to produce satisfactory results. Photograph sampling is the least expensive part of the census and, therefore, the greatest accuracy should be aimed at. (b) the mountainous, often hardly accessible terrain of north Thailand. To cope with the first difficulty the sampling system must be sufficiently clear-cut, based on routine work and must not leave any room for independent decisions by the field staff. The less accessible terrain requires from the point of view of economy that work in any particular plot be completed in a day. FIGURE 4. A camp unit. One crew should consist of two officers and two workers. The daily work of one crew should be 48 sample plots arranged along one tract. One camp's staff consists of seven crews, thus the daily work of one camp yields 7 tracts, or one " unit ". Details about the arrangement of the tracts and the sample plots inside the tracts are shown in Figure 4. It is obvious that everything becomes a matter of routine as soon as the staff has reached the center of the unit because every crew leader knows his bearing leading to the beginning corner of the tract as well as the corresponding distances from the center to the tract and from sample plot to sample plot (Figure 4). The unit centers have to he found first on the photograph, and later located in the field. To standardize this work, the camp unit system was developed. To find the unit centers in the photograph, the design of the camp-unit is prepared on one celluloid disk which has to be fixed on the corresponding photograph so that the principal point of the photograph coincides with the center of the camp and both of the cross lines (north/south and east/west) meet the corresponding fiducial marks on the margin of the photograph. The situation of each unit center can then be taken from the photograph which serves as a guide - through the use of a pocket stereoscope - in locating the centers in the field. If the total area of one camp is considered as a circle with a radius of 5 kilometers from the center up to the furthest sample plot, the percentage of cruise inside the camp area is 1.5 percent, because the total camp area amounts to 79 square kilometers whilst the sampled area can easily be calculated from 2,352 sample plots times 0.05 hectare which makes 1,176 square kilometers. The selection of the photographs used as camp centers should be mentioned. The percentage of cruise. aimed at is 0.1 percent (or 1:1,000) of the area below 1,000 meters above sea level. Work in the five provinces led to a sampled area of 50,568 square kilometers. or 43 camps. Out of the 1,500 photographs covering the five provinces those are omitted which fall in the area above 1,000 meters and the area covered by towns and permanent agricultural land which roughly works out to a total of about 20 percent. To obtain a systematic distribution of the camps throughout the five provinces. the remaining 1,200 photographs are subdivided into groups of 28 following the subsequent numeration of runs and photographs. Out of each group one photograph is taken at random to locate the reference camp. Thug, a restricted random distribution is used. It must be realized that by this method one biased error will arise with regard to the percentage of the area of the strata obtained by ground sampling. The non-forested area will be smaller and the area above 1,000 meters will not occur at all. But this error can easily be eliminated by use of the aerial photograph sampling described above. To check the interpretation of the aerial photographs, a special design was developed. The camp unit design itself is placed by photography on a glass, thus enabling the supervising interpreter to interpret the photograph along the tract already sampled by fieldwork (see Figure 5). This additional work was carried out on all of the 43 photographs used as " camps " in the field. The results have been compared with the stratification found in the field with a view to finding out the biased errors, if any. As already mentioned, the percentage of cruise of the area of a camp is 1.5 percent, while the total area below 1,000 meters is to be sampled by a 0.1 percent cruise. It is a well-known fact that the larger the ratio between the total percentage of cruise and that of the sub-sample, the more unfavorable is the efficiency of the sampling. Here the ratio is 1: 15. It should be mentioned that the 1.5 percent cruise inside the sub-sample seems to be the utmost concession with regard to the difficulties of the terrain. Some statistics obtained from the 43 finished " camps " may explain this. The average working time for one tract (daily work of one crew) is about 4 hours, ranging from 3 to 6 hours according to the type of forest and the terrain. The time to walk, or as far as possible to drive by car, from the camp site to the center of each unit amounts to 77 minutes (back and forth 154 minutes or 2.5 hours) on the average. But among the 301 surveyed units, 33 percent needed 4½ hours and 5 percent even 6 hours and more walking time back and forth on the average. It is obvious that, especially under tropical conditions, the average working time of 2½ hours walk plus 4 hours survey is strenuous enough. The unavoidable exceptional cases of more than 8 hours total working time must be rewarded by an additional rest day in order not to harm the health and spoil the enthusiasm of the staff. The practical performance of this camp-unit-system has proved satisfactory in the field (Figure 6). Two staff groups, each including a camp-leader, his aide and 14 crew officers worked independently from each other. They were supplied with strong cross-country jeeps and so were able to travel from camp to camp by car as far as the communications allowed. Sometimes buffalo carts or porters had to be hired to reach the site. On average, travelling time from camp to camp was 2 days (ranging from 1 to 6 days). One staff completes 2 to 2.5 camp-units a month. Thus, the 43 required camps for five provinces were finished in about ten months' field work. The question is frequently put as to why the small circular sample plot is used instead of strip system which could also be laid out in the form of a squared tract. Some advantages found under the conditions of the Thai forests may explain this. One tract contains 48 sample-plots, 0.05 hectare each, or 2.40 hectares sampled area. The same sampled area could be obtained by a strip of 12 meters in width, holding the same length of 2 kilometers used in the tract. But it has been experienced that the determination of the limit cases (trees standing just on the boundary) can be done more exactly in measuring the -distance from the center point of a circle than in drawing a perpendicular from the line. The main preference of any small sample plot is the easy determination of the appropriate stratum in which it falls. Having uninterrupted strips, the stratification must be done by distance measurement, leading to unequal parts of the strips according to the occurrence of the different strata. This involves difficulties in recording and punching. Furthermore, the correct determination of the spot on which the readings of the distance measurement along the line should be taken needs decisions by the crew leaders, which should be avoided. On the other hand, the stratification of the single sample plots is easy even in such cases where there are two different strata in one sample plot. The predominant stratum is to be taken. Sometimes aerial photographs do not bring out all the stratifications clearly, as in the case of the photographs available for Thailand. In such cases, further subdivision of the strata distinguished in the aerial photograph has to be made in the field. For instance, the mixed deciduous type of Thailand forests has to be subdivided into teak-bearing and non-teak-bearing types. In the field, all these sample plots fall into the teakbearing mixed deciduous type which shows some teak (i. e., teak trees, regeneration or stumps) within a radius of 25 meters even if, inside the measured sample plot of 0.05 hectare, teak does not occur at all. The area of the teak-bearing mixed deciduous type (= stratum 1) is obtained by taking the percentage of the total of the sample plots of stratum from the total of the sample plots of mixed deciduous forest. The total area of the mixed deciduous was already obtained by the photograph sampling. This figure has to be reduced by the percentage mentioned above. This is an example for the strata area originating from the combined (ground plus photograph) sampling, the errors of which are of course higher than those from the pure photograph sampling. FIGURE 6. 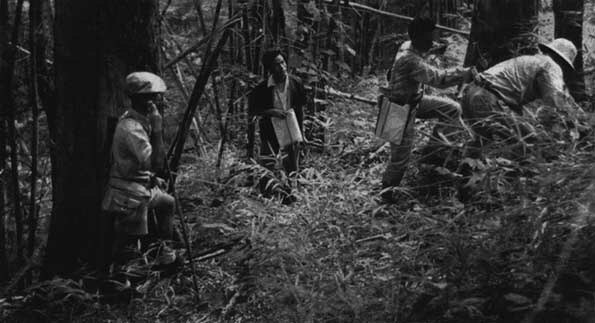 An inventory crew working in the teak-bearing area. 1. Tree species. Seventy-two important species are coded and have to be determined, while all other occurring trees fall into a collective code. Teak, as the most important species, includes five different codes: one for the growing stock, two for teak stumps, and two for girdled trees with and without official hammermarks to obtain figures of official and illicit cuttings. The punch-card system allows the results to be presented in any desired grouping scheme. As may be seen from the tally sheet (Figure 7), all three of the readings are to be put down, but only the average figure for them (next column) will be punched. From weight 14 and upward (diameter 67.90 centimeters) for teak a tape has to be used because of the irregular stem forms of the bigger teak trees. 3. Merchantable volume. The number of 5-meter logs is estimated ocularly from each tree from weight 3 and upward at breast height. In addition, the weight of each log is obtained by estimation for which the already measured weight at breast height is a great help. For regular teak stems with a continuous clear bole a table is used with the entries " weight at breast height " and " number of 5 meter logs per tree ", which allows the direct reading of the "sum of weight of logs " for that tree. It should be mentioned, that about 95 percent of the measured standing teak trees inside the sample plots show regular stemforms. Thus the volume of bulk of the teak was found by using this method. A word must be said about converting the stumps, measured under bark by tape at 0.30 meter high, into basal area over bark at breast height. The relation between girth at stump height and girth at breast height over bark was obtained by measuring about 3,000 standing trees. Using double logarithmic paper, a straight line could be obtained by the method of the smallest squares. The relation between diameter under bark and diameter over bark of the Thai teak was already known.1 Finally, the basal area over bark of the stump was converted into volume with the aid of the method mentioned above. 1 Inventory Methods for Tropical Forests, FAO ETAP Report No 545. To convert the sum of weights of logs into merchantable volume, (Hoppus cubic meters) the following multiplication must be made: sum of weights x 1140 (according to " Wanner weights ") x 5 (length per log) x 11/14 (Hoppus factor). The product of the last three factors makes 0.0982, or, for rapid estimates, rounded off to 0.1. Hence, the sum of weights of logs can be considered to be nearly tenfold the required merchantable volume. 4. Additional data obtained from each sample plot. The teak regeneration is sampled inside a concentric sample plot of 0.01 hectare. Four classes of young teak trees are formed: trees holding weights 2 and 1, then trees smaller than weight 1 at breast height but taller 1.3 meter and finally trees below 1.3 meter. The separation into " seed origin " and " coppice origin " seems to be important because trees originating from coppice origin are not likely to grow up to clear boles especially if the stump comes from an older tree. The site quality class of teak can be determined by the relation of circumference over height from predominant trees. If one big teak tree occurs inside a roughly estimated circle of 25 meters around the center of the sample plot, its height and circumference at breast height has to be measured. Thus, for the teak-bearing area m a whole, the percentage of the prevailing site quality classes will be obtained, which can serve as a help for the calculation of the growth to be expected. The diameter growth of teak is to be collected by a sufficient number of borings, for each site quality class. In addition, data are collected from each sample plot with regard to the prevailing kind of bamboo, and topographical and logging conditions. FIGURE 7. A tally sheet for sample plots. The tally sheet (see Figure 7) is ready for punching. For every occurring tree a special punch card is prepared. The five provinces have yielded 100,000 tally-sheets. Every sample plot, even if there is no tree on it, is put down on a separate tally sheet. The punching and verification can be done as soon as finished camps from the field arrive at Bangkok, thus avoiding any unnecessary delay. The results are tabulated for each province and, afterwards, for the area as a whole. 1. Forested area. For strata, directly obtained from aerial photographic sampling, the sampling error can be calculated by the analysis of variance. The teak-bearing mixed deciduous forest is the most important stratum. As already explained above, a combination between ground sampling and aerial photograph sampling must be made which-leads to an additional source of errors; both of the errors must be combined under the propagation of errors. The goal (± 4 percent sampling error for 5,000 square kilometers of teak bearing mixed deciduous) could be obtained. FIGURE 8. A graph showing the percentage of sampling error for volume Hoppus of Tectona grandis in the Thai national forest inventory. 2. Growing stock. From the ground Sampling the stock per unit area of each referring stratum was obtained which is multiplied by the known area sizes of each corresponding stratum. The sampling error of the stock per unit area can be found by a special kind of analysis of variance. Using the propagation of errors, again, the final sampling error of the growing stock (see Figure 8) can be. calculated. The goals (± 10 percent for 1 million cubic meters and ± 5 percent for 10 million cubic meters) could he obtained. To illustrate the accuracy obtained for the Thai National Inventory, the goals set for the Swedish as well as for the U.S. National Inventory are marked in the appropriate figures. Salary and perdiem for 35 officers, (= 2 field and 1 headquarter's staff) wages for 70 workers and 6 car drivers, wages for porters, mules, cost for gasoline, repairing the cars, etc. It should be taken into consideration that the Forest Inventory 1956/57 carried through by the Royal Forest Department of Thailand was the first one of its kind. A certain amount of time was taken to overcome administrative difficulties. In addition, the time necessary to train the staffs has not been eliminated from the above Table. It can be assumed that, using the experience obtained, costs for the forest inventories of Thailand of the future can be reduced by about 10 to 20 percent of the above figures.